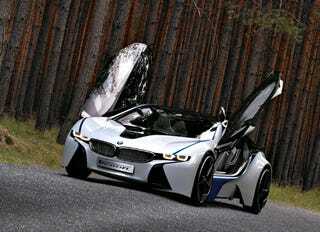 The BMW Vision Efficient Dynamics Concept is a full hybrid powered by a three-cylinder turbodiesel connected to a pair of electric motors pumping out 265 HP and 590 lb-ft of torque. Oh, and it looks like it's from Tron. visualising the dynamic performance typical of a BMW against the backdrop of future demands in sustained mobility. BMW Vision EfficientDynamics as a symbol for the future of Sheer Driving Pleasure in harmony with trendsetting efficiency. • The 2+2-seater concept combines dynamic performance and supreme efficiency with an enhanced level of all-round function. BMW Vision EfficientDynamics symbolises BMW's commitment to offer an unprecedented driving experience for up to four occupants. • The interior of this unique 2+2-seater intentionally demonstrates the very latest in modern technology. At the same time the use of natural materials underlines BMW's strategy of sustainability borne out through this concept car.